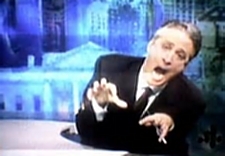 Do you watch “The Daily Show with Jon Stuart?” If you don’t, you should, no matter what your political persuasion. Frankly, you will learn more about our government and society on that show than any news program. For example, last night Jon pointed out something that I was not aware of, but I found quite shocking. As usual, he did it in his humorous fashion, which is probably the only reason I didn’t throw my shoe at the tv. For some time now our nation has been in a battle over funding itself. We’ve had the Fiscal Cliff, and the Budget Debates, and the Sequester. Most have been little attempts to kick the budget needs down the road. While many argue that they want a Grand Bargain, honestly, can kicking is what most families in this country do. We punt for a few yards, hoping we can fix some of our fiscal problems before we have to punt again. So why anyone would feel it is a totally inappropriate approach I cannot quite understand. It is a rather normal approach, really. Anyway, recently a semi-grand bargain was reached, funding the government until September. Oh boy, a six-month reprieve from talks about Fiscal Cliffs and government shut downs. The Sequester still looms, and I am sure we will feel those hardships before too long. But at least we won’t have to see all the fingers pointing from DC for a little while. But wait, while you may think that is good news, did you know that snuck into that budget bill were several hidden amendments? Like an amendment that makes it illegal to stop production of any Genetically Modified Foods, even if they go into litigation? Get that? If it is determined that a genetically modified food is harmful, it is now illegal to force a company to stop producing it. One company that greatly benefits from this, and has been a proponent of it for some time, is Monsanto. Or did you know that someone snuck into the budget bill some amendment provisions that make various pro-gun provisions protecting gun manufacturers and gun sales permanent? That’s right. While passing a budget bill, they snuck in amendments that make it impossible to produce some gun safety measures. Fortunately, any law that can be made can be unmade, maybe. But here is the real kicker. These amendments, which are pure giveaways to big companies and have the potential to hurt or kill American citizens, were put into the bill anonymously. That’s right. It seems there is a rule that allows amendments to be added to a bill while that bill is in subcommittee hearings, and that those amendments can be introduced anonymously. It is entirely possible that the Genetically Modified Foods amendment was literally written by Monsanto itself. At this point no one knows who introduced those amendments. They were not debated on the Senate or House floors. It is entirely possible that our laws are now being written by big business itself. Shame on the Senators who will filibuster the dropping of a hat, but didn’t even hick-up at things like this. Shame on the Congress who won’t pass anything with a Democrat’s name on it, but who will pass amendments that are nameless and untraceable. You would think those Republicans who are terrorized of Sharia Law would have stopped the bill until they could have researched who wrote the amendments, thinking they might lead to some Commie plot like Fluoride in our water. But no. They let those things go through, because they are good for big business, and bad for people. It is enough to make you want to rant on a daily basis.